From tourists on the popular Game of Thrones trail around Dubrovnik to fine cuisine off the beaten track, the Adriatic Coast is home to your next unforgettable holiday getaway. THE Adriatic Coast has long been a draw for the more discerning traveller, and one glimpse of its sparkling turquoise waters will have you completely hooked. On a 12-day trip to Dubrovnik last month, I made the mistake of asking our tour guide what time of year is best to visit – “All year round, of course” came the bemused reply. Croats are fiercely patriotic, and while they come across as a bit stern at first, they have a wicked sense of humour and a quick wit, and they love the Irish banter. The summer months are in fact the busiest – but the sunny weather comes at a price, with swarms of tourists disembarking cruise ships daily to throng the city’s Old Town. Shoulder season (April and October) is favoured by those in the know as temperatures still climb into the 20s and tourist attractions are open, but you can avoid the crowds and higher prices of peak season. Whilst I was expecting breathtaking scenery along the coastline, it’s no exaggeration to say I was blown away by the endless vistas with a picture-postcard view at every turn. We stayed in Cavtat, a charming harbour resort just ten minutes’ drive from the airport, and 45 minutes from Dubrovnik by water taxi (less by bus). The five-star Hotel Croatia was the perfect base for exploring. It’s tucked into the hillside with commanding sea views and sunsets you feel you can almost reach out and touch. The only downside is the steps leading down to the resort, but they’re well worth negotiating and can shave 10 minutes off the journey. Despite a luxurious sun deck on the fifth floor (complete with heated indoor pool, sauna, spa and gym), it’s hard to resist the urge to explore the coastline. We took four trips into Dubrovnik but could easily have doubled that. And while we packed a lot in, we’d gladly have done a lot more if time permitted. 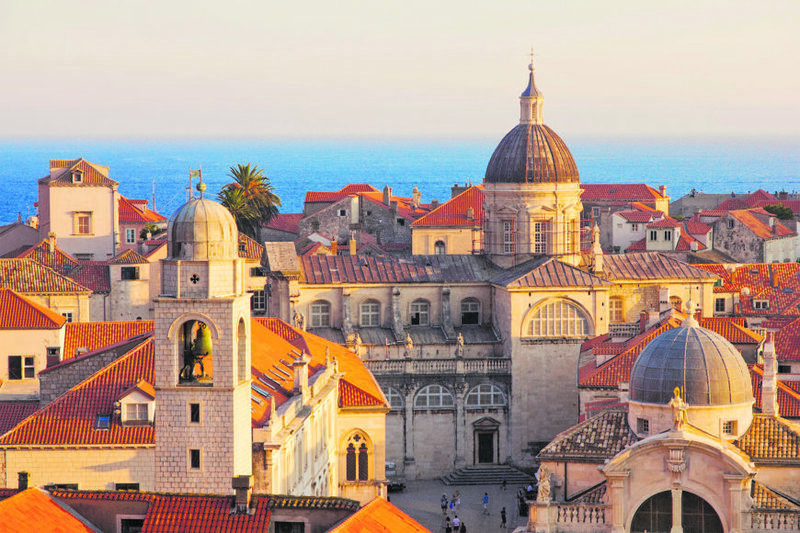 The Old Town – better known to Game of Thrones (GoT) fans as King’s Landing – is all white limestone, cobbled streets and red terracotta roofs. Being a GoT fan, I enrolled on a half-day guided tour taking in some of the series’ best-known filming locations, including Flea Bottom, the Red Keep, Little Finger’s brothel, Black Water Bay and the steps used for Cersei’s Walk of Shame. 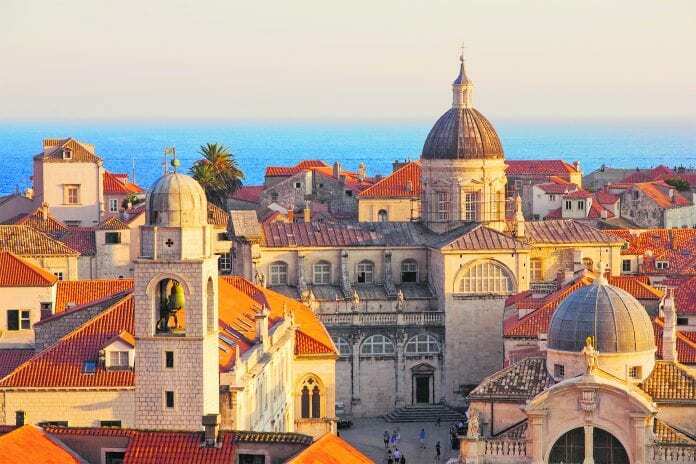 As one of TV’s most popular dynasties, the Lannisters (including scheming Cersei, played by Lena Headey, right) have played a big part in making Game of Thrones the global hit it is – and Dubrovnik is a big star within the show. 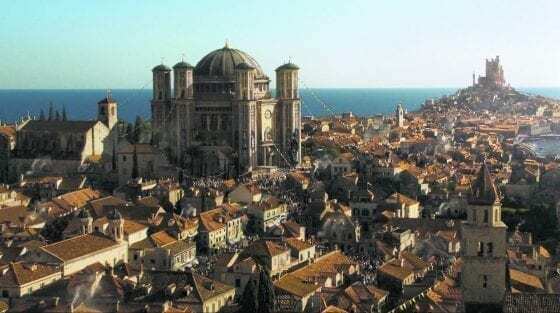 The city’s Old Town district has played a key role in the show all along, with several locations needing just a little CG trickery (above) to help create the city of ‘King’s Landing’, attracting thousands of fans to Dubrovnik. 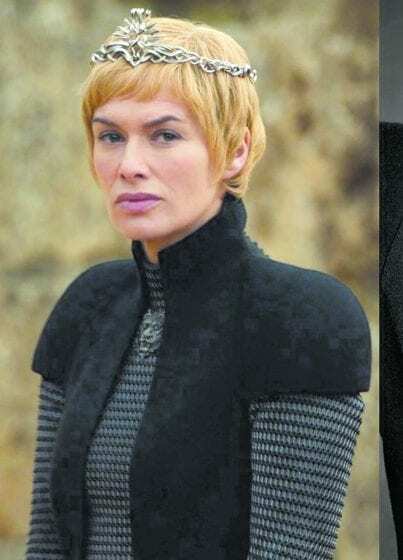 The GoT team playfully shout “Shame!” as they pass each other in the street – and our guide, Tea (who played Peasant Number 346 in one episode) gave us the inside track on the actors with Peter Dinklage her undisputed favourite. Things to do in Dubrovnik are many and varied – and probably too lengthy to list here – but our highlights included walking the historic city walls (be prepared for a 60-step climb, but it’s worth it) and a panoramic tour to the fortress of Mount Srd, which can also be accessed via cable car. The city takes on a different feel after dark with restaurant tables spilling out onto the cobbled streets. If you’re undertaking the climb for the cable car, stop off at Lady Pi Pi for lunch (and look out for the interesting statue outside). Eating a traditional Peka dish (typically lamb or beef, slow-cooked under a hot iron bell for three hours) is also a must for all foodies – but be warned, you have to order it in advance. As the richest city in Croatia, Dubrovnik is not cheap – but its prices are not a million miles away from what we pay here. There is a heavy Venetian influence, which is good news for all coffee lovers. Expect to pay around €2.50 for an ice cream or a coffee, €7 for a glass of wine and €20 for a main course. A 15-minute ferry trip to Lokrum Island is also worthwhile. Here you will find botanical gardens, an old monastery and an army of roaming peacocks, who show no hesitation in wandering right up to you and posing for a photo. The fishing town of Mali Ston is less than an hour away and is famed for its oysters. Closer to home, the waters off Dubrovnik are speckled with more than 1,000 islands. 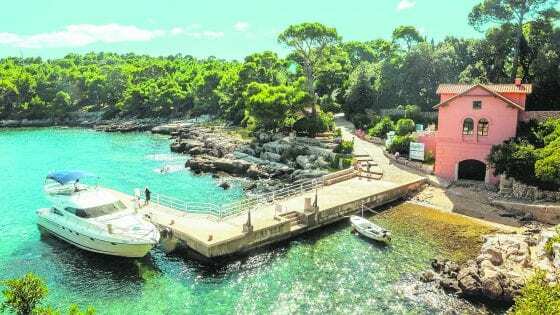 Daily cruises to the Elafiti group of Kolocep, Lopud and Sipan are popular – as is D’Vino’s Bar as a top destination for sampling Croatian wine, which offers three locally produced vintages on its taster menu. If you find you’re running out of cash, you can dine on the cheap at Buffet Skola, where the prsut (similar to prosciutto) sandwich is a top cheap dish. We took a full-day tour to Montenegro with our own private driver, Bozo Crvik (www.perfect-travel-croatia.com). It was the perfect way to travel and Bozo (pronounced Borzh) tailored the day to our needs and had an encyclopaedic knowledge of the surroundings. We stopped off for countless photo opps before spending two hours in the Old Town of Kotor. Then it was on to Buddva – a beach resort popular with the likes of Madonna and Sting just a stone’s throw from St Stephen’s Island, where parts of Casino Royale were filmed. A day trip to Mostar in Bosnia Herzegovina was a real eye-opener. This one we did by coach, and once we’d crossed the border after a 30-minute delay, the change in the landscape was immediately apparent. Mostar is the largest city in the Herzegovina region and suffered the worst damage during the war. After a tour through the Old Town (a UNESCO World Heritage site) with an English-speaking guide, we got free time to shop and eat. 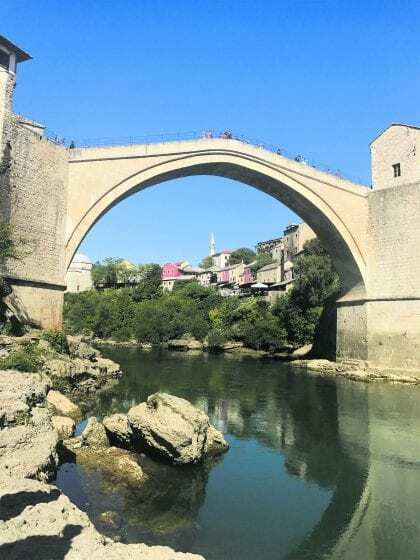 Unexpected bonuses were seeing a plucky swimmer take the 24-metre dive off the Stari Most Bridge and the Aladdin’s Cave of souvenir shops stuffed with hand-crafted copper, silver, stained glass, jewellery, silk and tapestries. All too soon it was time to depart. Our Aer Lingus flight home was populated with pilgrims returning from a visit to the shrine at Medjugorje. Two women shared their experience in the perfume aisle of the duty free. Aer Lingus fly direct to Dubrovnik and several tour companies provide package deals to Cavtat. Click & Go (www.clickandgo.com) will tailor your trip, while Croatia Tours (Croatia.ie) offer multi-destination holidays allowing you to split your time between Croatia and neighbouring Montenegro.